My saving grace from becoming a picky eater as an adult was the fact that I would eat anything as a child, even if I didn't like it. In hindsight that was probably also my detriment in life ... but we don't have to go into that deep hole today. Instead, let's enjoy these bright and delicious morsels. And try not to eat them all before it's time to serve. Rinse, cut the tops and halve each carrot. 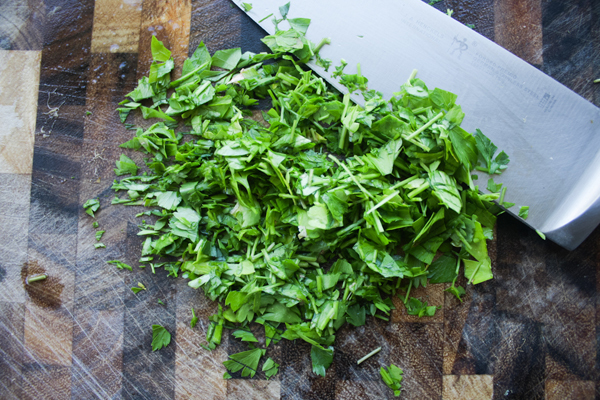 Chop the parsley and set aside. In a large bowl add all of the carrots, lemon juice and zest, brown sugar, salt, pepper and olive oil. Toss to coat the carrots evenly. Line a baking sheet with parchment paper and put all of the carrots on top. Spread them out so no carrots are on top of each other. Roast in the oven at 425° F for 30 minutes, or until some charred spots form. Take out of oven and top with the fresh chopped parsley.